The ACBplus has 7 models in the range, with capacities from 150g up to 3kg and readabilities from 0.005g to 0.1g. 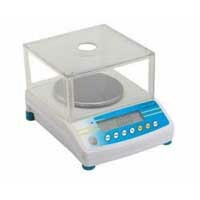 The balances have the ability to display 15 different weighing units such g, ct, lb, oz, d, GN, oz t, dwt, mommes, Taels (Hong Kong, Singapore and Taiwan), ti, N, g2. and functions include parts counting and percentage weighing. The new ACBplus has a lot of new features such as a large and very stable case in a modern attractive design, an integral security bracket, capacity tracker and a low battery indicator. As well as being supplied with an AC adapter these scales also have an internal rechargeable battery making them totally portable. Standard features are a draft shield for precision weighing and RS-232 interface. To ensure consistent accuracy and tip-top performance the ACBplus can be easily calibrated using the auto calibration function through the keypad. Draught shield dimensions: 180 x 158 x 82mm / 7.1 x 6.2 x 3.2"